million members, AARP is a strong voice for the 50+ community in the US. 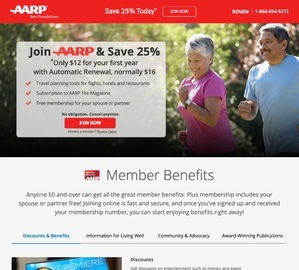 With membership to AARP, consumers gain access to discounts, programs and services. Each carefully selected program offers consumers a wide variety of benefits that are researched extensively by AARP to make sure each meets quality standards. Click a Coupon or click Start Shopping to earn $8 Cash Back at AARP.